Revolutionary era postal officials Benjamin Franklin and Hugh Finlay knew how hard it was to move mail from place to place. As Deputy Postmaster General, Franklin purportedly traveled the entire length of the colonial postal system with a homemade odometer to measure the distance between post offices. He took the trip as part of his broader effort to standardize postal rates, routes, and practices, and thereby ensure faster and more frequent communication among colonies. By all accounts, Franklin’s efforts did improve postal service, but long-distance travel with a heavy mailbag simply took a long time in the eighteenth century. About a decade after Franklin’s journey, Hugh Finlay, a postal surveyor, traversed a similar route and kept a travel journal filled with notes of roadblocks and lapsed deliveries. Distance was still a barrier despite Franklin’s improvements. Finlay penned a map during his journey of potential post roads to facilitate speedier and more reliable travel in the future.1 In their different ways, Franklin and Finlay worked to solve the geography problem at the heart of eighteenth-century long-distance communication. They did so because they bought in to the enlightenment ideal that the circulation of information (by mail or otherwise) would spark improvements in society, economics, and politics. We find ourselves in a very different media landscape today. Thanks to social media, writers and readers are connected on an incredible scale. To us, this dream world of total connection is no utopia. Just as faster communication does not make people feel more intimately connected (and, in fact, some studies have suggested that it has resulted in a greater sense of alienation), access to endless amounts of information does not make the national populace any smarter. It’s safe to say that the enlightenment ideal—that speedy instantaneous communication could unite and elevate a populace—is not broadly held today. The Bradstreet Fellows, courtesy of the author. I’ve found particularly generative for reimagining the relationships between communications technology, geography, and the stories we tell in my own digital humanities pedagogy. 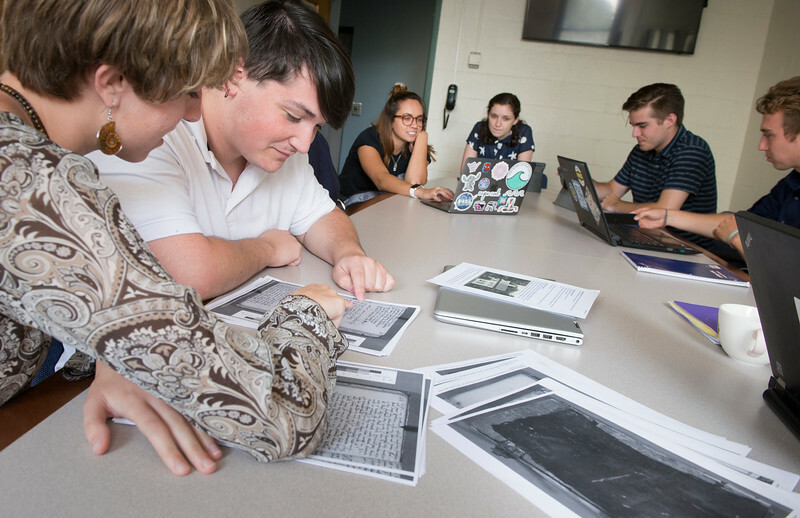 This summer, I embarked on an experiential learning project—Finding Anne Bradstreet—with eight undergraduate students, a fellow faculty mentor, and community partners at local archives and historical societies. Finding Anne Bradstreet is based out of Merrimack College in North Andover, Massachusetts, just over a mile from the colonial settlement of Andover, the home of Anne Bradstreet (the seventeenth-century Puritan poet). The stated goal of our program is admittedly sensational: We sought to find Bradstreet’s long-lost grave through a combination of local archival research and non-invasive archaeological practices like remote sensing, aerial photography, and ground-penetrating radar. Our less sensational goal is to learn more about Bradstreet’s poetry and life through the local environment. We asked students to consider how the natural world may have influenced Bradstreet’s poetry; if references to “a stately elm” in “Contemplations Divine and Moral,” for example, might speak directly to the trees that surround our campus. We also asked students to consider what Bradstreet does not incorporate into her poetry—contact and conflict with indigenous groups, in particular, and the presence of enslaved people in Massachusetts. Our archival research has allowed us to better understand what her poetry does and doesn’t say, and what these omissions suggest about her world and the full range of power structures and systems in which she was enmeshed. Up to this point, we have conducted a great deal of archival research, and we’ve learned a lot about Bradstreet, her poetry, and the history of the community. Now, we are using digital tools and practices to share what we have learned with others. To do so, we are creating a mobile walking-tour app that allows contemporary audiences to experience Anne Bradstreet’s poetry through the landscape of North Andover. In total, the full tour will be about two and a half miles, bridging our campus, the North Andover Historical Society, the old town common, the first burial ground, and other key landmarks. When a listener arrives at a particular location, a video, archival image, or recording of her poetry will pop up on their phone. We expect that this multimedia approach will make Bradstreet’s poetry more accessible and immediate for contemporary audiences. The narrative we are designing within the tour will challenge our listeners to contemplate nature, poetry, mortality, and communal life through Bradstreet’s poetry during a walk through North Andover. In doing so, the tour asks our audience to engage with the local environment in a new way; the town has a long history—it’s weird, troubling, and compelling by turns—and we want our audience to confront this story in its full complexity. In my mind, the walking tour points to a compelling affordance of digital technology that pushes against the understanding I described at the outset. Here, the walking tour engages geography not as a barrier to communication, but rather as an asset to it. The walk from campus to the old town common slows down the audience’s experience with history and literature through a spatial register. By using geolocation, the narrative unfolds over space at the speed of the individual traveler. In this way, digital tools can animate the connection between an individual and their local environment. These technologies can help us foster a more intimate experience with the land beneath our feet. 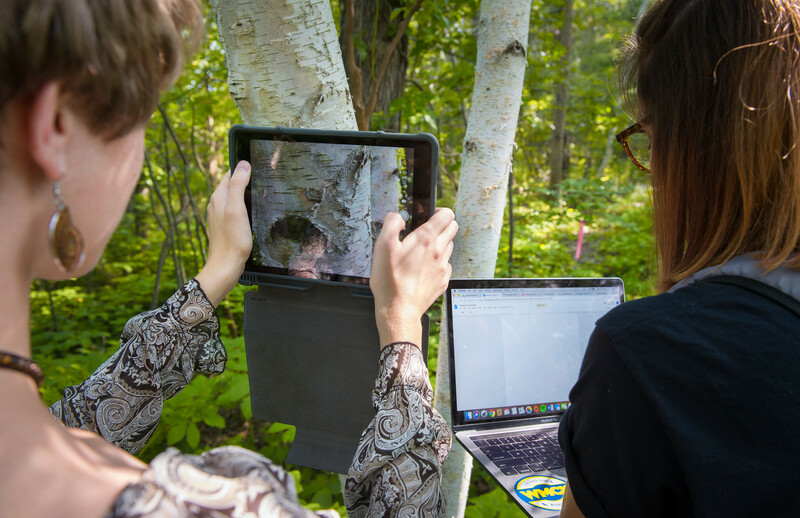 Using the tools and practices of digital humanities to better understand the local environment has taken on a new urgency for me in the wake of recent reports on climate change. The United Nations report is especially dire—but it is also an opportunity for scholars to “know the work we want our work to do” (to borrow a phrase from Barbara Tomlinson and George Lipsitz).2 Digital humanities, I think, can help us articulate the subtle slow things that matter in an often painfully fast world; technology itself does not bring us together or make us better, but it can be a tool that calls attention to past and present connections that are themselves rich and expansive. The Finding Anne Bradstreet project has been a reminder that slowness itself can be a kind of resistance; one that draws attention to the environment and our relationship with it. Taking a walk won’t reverse climate change or dismantle capitalism, but it might offer an opportunity to think about how we can move more deliberately into the future. 1 For more on Hugh Finlay’s difficult postal survey, see Trish Loughran’s Republic in Print: Print Culture in the Age of U.S. Nation Building, 1770–1870 (New York, 2007). For more on Benjamin Franklin as the enlightenment communications engineer of the British Colonial Mail, see William Beatty Warner’s Protocols of Liberty: Communication Innovation and the American Revolution (Chicago, 2013). 2 Tomlinson, Barbara, and George Lipsitz. “American Studies as Accompaniment,” American Quarterly 65, no. 1 (2013), 1–30. Christy Pottroff is an assistant professor of English at Merrimack College.